THE STORY - Tyler joins his friend on a trip to the Catskills for a weekend birthday party with several people he doesn’t know. As soon as they get there, it’s clear that (1) he’s the only black guy, and (2) it’s going to be a weekend of heavy drinking. Although Tyler is welcomed, he can’t help but feel uneasy in “Whitesville.” The combination of all the testosterone and alcohol starts to get out of hand, and Tyler’s precarious situation starts to feel like a nightmare. THE GOOD - Jason Mitchell continues to be a star on the rise. He brings the viewers directly into the awkwardness and discomfort he feels from experiencing the events of the weekend as an outsider. THE BAD - The film covers some of the same social commentaries that are visited in “Get Out," but without the horror/fantasy elements and with a much less defined narrative structure. This will hurt the film's wide audience acceptance. ​​​We begin by meeting Tyler (Jason Mitchell) and his friend, Johnny (Christopher Abbot) out of gas and pushing their car up a hill. It is clear they have a history and a solid friendship. They are awaiting the arrival of Johnny’s other friends to bring them gas. On their way to a cabin in the Catskills, they plan is to spend a guys weekend to celebrate the birthday of Pete, played by Caleb Landry Jones. The introductions are awkward, with one of the friends referring to him as Tyrel, forcing Tyler to correct him and thus the titular reference is born. Pete, uncomfortably swears to Tyler they had met before when indeed they didn’t. Director, Sebastian Silva, does not relent but lets us linger on the discomfort of the exchange. A lot of alcohol consumption finds the rowdy crew playing a game. The idea is to recite a line from “The Silence Of The Lambs” in a specific type of accent drawn, that each player draws out of a hat. As you can imagine, one of the choices is “black voice” and causes for some cringe-worthy moments. The group is not lacking in diversity completely and includes a gay character, Dylan (Roddy Bottum) and an Argentinian, Nico, who is the host of the party. Alan, played by Michael Cera, later joins the group in a seemingly ominous entrance that quickly turns to be benign, but continues to keep the audience guessing on what his motivations are. Over the course of two days, and copious consumption of drugs and alcohol, the claustrophobia becomes palpable to the audience. In another interesting turn, this weekend happens to be overlapping with the inauguration of Donald Trump and is very specifically time referential to 2017. There is some shared camaraderie, particularly politically, but as religious discussion ensues, things become tenser. For certain, at every turn, you are always expecting something bad to happen. The film very successfully creates that tension. 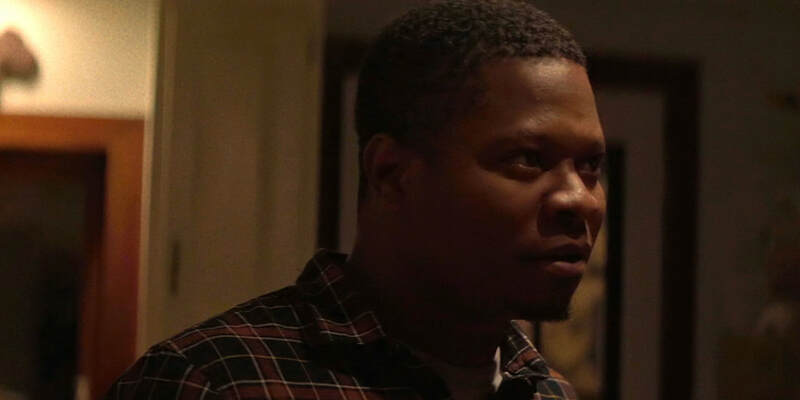 Jason Mitchell continues to impress with recent turns in “Straight Out of Compton” and last year’s critical favorite, “Mudbound." This is an interesting and meaningful addition to his filmography and another representation of his range. He is the reason to see the film as he truly takes the viewer on a journey of an everyday situation and what it means to not know how or even if you want to connect with certain situations. The other cast members successfully embody the idea of over-compensation to help Tyler feel accepted, and that I feel lends smartly to the themes of the film. It ultimately ends up being wrapped up much more in the subtle than the overt. This is a voyeuristic type watch that will have a low key release and following. I do believe there are relatable moments for any viewer, although it may depend on who you are. There are some surprises in the film, but not enough to draw mass appeal. It is also a very specific commentary to 2017 and may lose long-term staying power as a result, although I did find that helped the film’s short run resonance. There is a lot of shaky camera work that I believe was intended to lend to the feeling of inebriation and unease, but that too was also distracting at times. In summary, this a solid piece of independent work, with a meaningful message. I think it will have a following in the independent film circuit and hopefully continue to boost the star power of Jason Mitchell. I believe general audiences will be frustrated with the lack of narrative structure that did not have enough else going to balance that choice. I will be interested to continue to see other exploratory films from Sebastian Silva though.